Site Directions: On I-75, take exit number 25 in Cleveland, Tennessee. Travel north on Highway 60 through the town of Birchwood. Approximately 1.7 miles north of Birchwood, turn right on Shadden Road. Go one mile and turn right on Blythe Ferry Road. Take the next left on Priddy Lane and follow signs. Seasonality: The refuge is closed from November 15 to the last day in February; however the Observation Platform is open year-round. Site Description: The Hiwassee Wildlife Refuge is 6,000 acres (2,500 acres land and 3,500 acres water [Hiwassee River]) located on Chickamauga Lake at the confluence of the Hiwassee River with the Tennessee River. Beginning at Hwy 60 (over the Tennessee River, about river mile 499.5), the refuge stretches to around river mile 505 at Armstrong Bend and from the mouth of the Hiwassee River upstream to Hwy 58 at Agency Creek (about river mile 7.4). 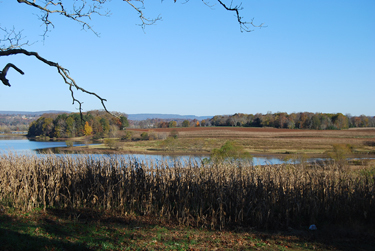 Included is Hiwassee Island (400 acres). Of the land area, approximately 30% (750 acres) is agricultural land that is cropped. Crops grown include corn, wheat, soybeans, milo, varieties of millet, and buckwheat. Most of the refuge is farmed by TWRA personnel. The remaining 70% of the land area (1,750 acres) is a wooded mix, mainly of pine and hardwood forest. 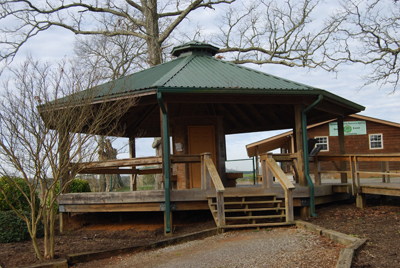 A wildlife Observation Platform is open year-round to visitors. Wildlife to Watch: Hiwassee Refuge has the largest winter flock of Sandhill Cranes in the southeast United States outside of Florida. From the Observation Platform, visitors can view Sandhill Cranes and an occasional endangered Whooping Crane from November through February. Peak numbers of cranes occur in January. Waterfowl numbers are good for the area of the state with birds visible on the lake below the Observation Platform and on the river in the distance (often only really seen as flybys). Mallard, Gadwall, and Northern Shoveler are the most common ducks, but Canvasback, Ring-necked Duck, among others are found. Bonaparte's Gull and Ring-billed Gull are common in winter. Great Blue Heron numbers are substantial in winter. Bald Eagle numbers in winter rank among the top five in the state with many often seen from the observation area in winter. A couple pairs of Bald Eagles nest in Hiwassee Refuge. Golden Eagles are rare, but seen annually at Hiwassee Refuge. Osprey are common to abundant from March through September. In December 2011 - January 2012, a Hooded Crane was present and viewed by several thousand birders from across the entire United States. 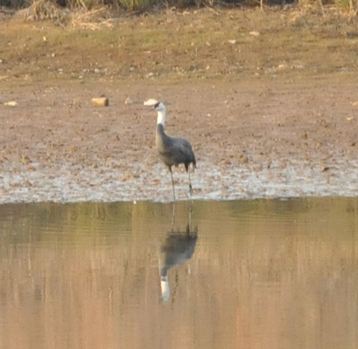 The Hooded Crane disappeared in late January and 3 days later a Hooded Crane was found with Sandhill Cranes in Indiana.